Part of the fun of working with so many newspapers is reading about how people have celebrated different holidays over time. The Texas Borderlands Collection, in particular, shows how Texans near the border have celebrated Thanksgiving each year, and different newspapers give us a window into people’s desires, needs, or fears across different eras. The Ranchero, from November 17, 1860, declares that “Gov. Sam Houston has appointed Thursday, the 20th of November as a day of thanksgiving and prayer.” Before 1863, Thanksgiving in the U.S. was observed on different dates, varying from state to state. The first proclamation of an official national holiday occurred in October 1863, by President Lincoln, who proclaimed that Thanksgiving would be celebrated on the last Thursday of November. Prior to this proclamation, states chose their own dates to celebrate, as evinced by Sam Houston in 1860. 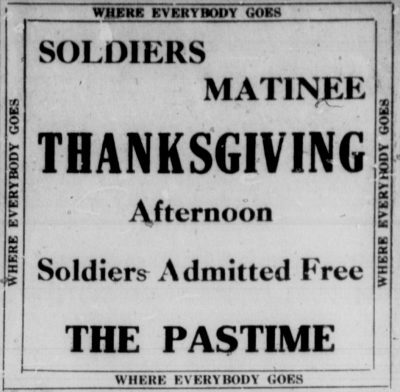 At the height of World War I, the Pastime Theatre in San Beinto, Texas, hosted a free matinee showing of “The Girl from Frisco” for soldiers’ Thanksgiving, from 2:15 pm to 5:15 pm, as reported in the November 29, 1916, Oklasodak. In Pecos, Texas, the November 30, 1923, issue of the Pecos Enterprise and Pecos Times reports on the Senior Class’s Thanksgiving dinner for the surrounding cities around Pecos. Meat and potatoes were the main courses, accompanied by “salad, coffee, pie, and other goodies.” The senior students also located housing for guests staying overnight. 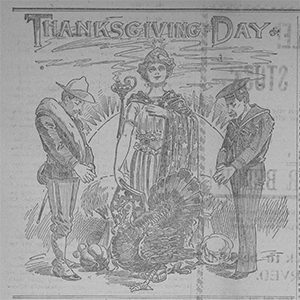 Later, from Thanksgiving 1942, The Benavides Facts displays an elaborate THANKSGIVING masthead, with U.S. soldiers peeking out from behind the letters. 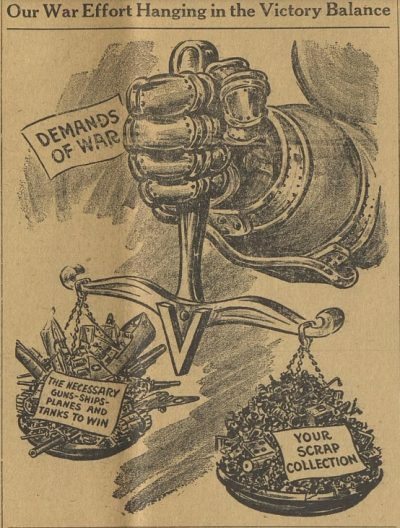 Just below the masthead, a large political cartoon dominates the pages, explaining that your scrap will support victory in the war. Long-term success of the 1939 Thanksgiving date change appears in the June 17, 1976, issue of The Pharr Press which showcases a new, nearly $500,000 retail center in South Pharr, for one supermarket and two other retail stores,whose opening date was tentatively set “on or before Thanksgiving” of 1976. In 1991, the Holy Cross Mission, La Rosita, hosted a Thanksgiving raffle for the Building Fund Committee, and in the December 4, 1991 Duval County Picture, the Mission published thanks to the community for its tremendous support. However you celebrate Thanksgiving this year, remember you are celebrating a long tradition. Have a happy Thanksgiving! Access to this collection was made possible through the support of a TexTreasures grant. TexTreasures is an annual competitive grant program designed to help member libraries make their special collections more accessible to researchers across Texas and beyond. TexTreasures awards have been made possible by the Library Services and Technology Act through the support of the Institute of Museum and Library Services. Posted November 20th, 2018 by Ana Krahmer & filed under Featured, General, Texas Digital Newspaper Program, TexTreasures.